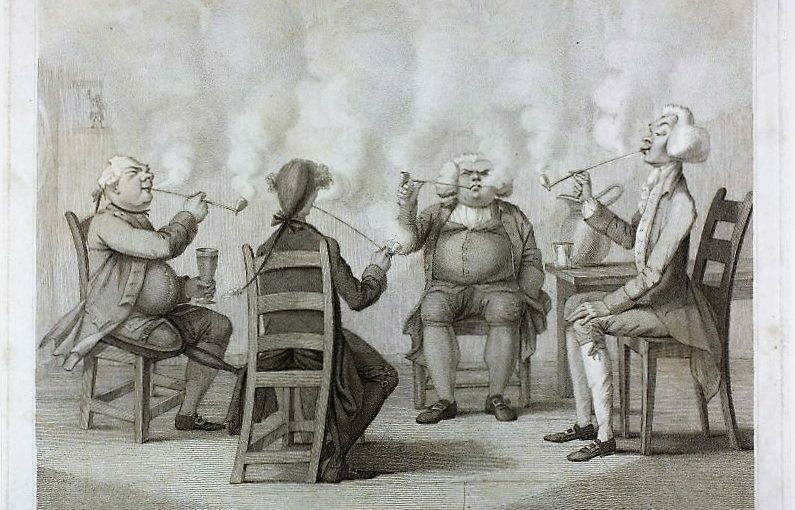 So much, and often so much nonsense, is prated about the evils of tobacco that its virtues rarely get a hearing, and yet the latter are many and great. To quiet nervous rest; to soothe a ruffled temper; to favour calm and partial thought; to steady and clear (not to cloud) a confused, overworked brain; to counteract the effects of physical exhaustion—these are just the things which tobacco does, and if it can effect these ends safely and pleasantly, who shall deny it a place among God’s good gifts to men? A Dutch merchant, named Klaes, who was known among his acquaintances by the name of the King of Smokers, has just died near Rotterdam. According to the Belgian papers he had amassed a large fortune, and had erected near Rotterdam a mansion, one portion of which was devoted to the arrangement of a collection of pipes according to their nationality and chronological order. I’d love to know what happened to this museum of pipes. A few days before his death he summoned his lawyer, and made his will, in which he directed that all the smokers of the country should be invited to his funeral, that each should be presented with 10 lb. of tobacco and two Dutch pipes of the newest fashion, on which should be engraved the name, arms, and date of the decease of the testator. Either he wasn’t expecting much of a turnout, or he was very wealthy indeed. He requested all his relatives, friends and funeral guests to be careful to keep their pipes alight during the funeral ceremonies, after which they should empty the ashes from their pipes on the coffin. The poor of the neighborhood who attended to his last wishes were to receive annually, on the anniversary of his death, 10 lb. of tobacco and a small cask of good beer. He desired that his oak coffin should be lined with the cedar of his old Havana cigar boxes, and that a box of French caporal and a packet of old Dutch tobacco should be placed at the foot of his coffin. His favorite pipe was to be placed by his side, along with a box of matches, a flint and steel, and some tinder, as he said there was no knowing what might happen. With that amount of tobacco in the coffin, I really hope he was cremated. A clever calculator has made out that Mr. Klaes had, during his eighty years of life, smoked more than four tons of tobacco, and had drunk about 500,000 quarts of beer. And no doubt it was. Though I suspect a study on the effects of smoking four tons of tobacco might show a disappointingly high mortality rate. I don’t even mean to come off as pro-smoking, but if you stop and do the math, almost every smoker passes 1 ton and probably 10 tons of tobacco in their life. Cigarettes weigh approximately 1 gram and have between 65% and 98% tobacco. Let’s use the lower figure as a conservative estimate, giving each cigarette 0.65 grams of tobacco. Taking a low rate of half-pack(10 cigarettes) a day, you have 237.2kg(523lb) of tobacco smoked per year. You will hit 4 tons of tobacco in 15 years of smoking at rather minimal rates. Assuming a higher tobacco content of 75% and rate smoking at a whole pack a day, the smoker will consume 547.5kg(1,2071.4 lb) of tobacco a year(an increase of 130.8%), and 4 tons would be consumed in much less time, approximately 6.6 years. From what I understand, the conservative estimate covers just about anyone who smokes regularly, and the increased estimate covers the heavier end of smokers(and certainly not the extreme multi-pack smokers). The article is referring to pipe tobacco, so the weight smoked will ultimately be lower than cigarettes, but certainly not by an entire order of magnitude. Considering the average life-time smoker smokes for well over 20 years, I’m going to call bunk on your claims about the lethality of smoking 4 tons of tobacco. Of course, measuring tobacco usage in that way is not really a good way of doing so, and is probably why you don’t see it referred to in that fashion. Thanks for your comment. I’m afraid there’s an error in your maths: if each cigarette contains 0.65 g of tobacco, and ten are smoked per day, that’s 6.5 g per day, or 2372.5 g (2.3 kg) per year – 100 times less than your figure. A paper published a few years ago (http://www.ncbi.nlm.nih.gov/pubmed/15791025) made a similar estimate to yours for the mass of tobacco per cigarette, suggesting 12.5 g per pack of 20 was about right. 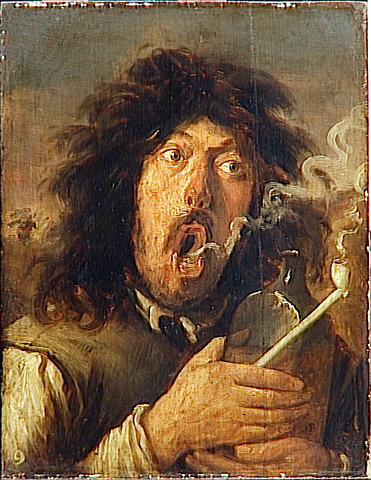 Given that 4 imperial tons = 3629 kg, according to my calculations the King of Smokers was getting through the equivalent of c. 11 packs per day, assuming he started smoking at the age of 10. On balance, I stand by my suggestion that this is likely to be lethal for most people! The first estimate would take about 1500 years to go through 4 tons; the second 667 years; 2 packs a day would still take over 300 years to smoke that much. I have a feeling that modern cigarettes are probably much more efficient at utilizing tobacco than the pipes of yore; waste(or sharing) can be the only way to account for so much consumption. Given that the other figure cited, 500,000 quarts of beer, equates to 40 pints of beer per day starting at the age of 10, I think it’s fair to say that the ‘clever calculator’ was not quite so clever after all. I definitely don’t agree that tobacco is good for you, it’s only a very short relief for the things mentioned, then two minutes later you need to use again. Definitely not worth the consequences. However, there is one thing that tobacco does actually help that’s worth it. Ulcerative colitis. Actually, it’s the nicotine in the tobacco that can suppress the horrible hell that is UC. The alternative treatments for UC are often worse than the effects of smoking. If only a nicotine pill would be made for its sufferers. I’d rather get hooked on nicotine pills than be forced to take very high doses of steroids for the rest of my life. Trust me, I had UC. I don’t anymore because it got so bad that my large intestine got so distended that the blood actually stopped flowing. The intestine had died and I had an emergency colectomy. I was on steroids at the time, for about a month, and this still happened to me. Also, I started growing a mustache and chest hair! I’m a woman, for crying out loud! Sorry for the rant. Also, your blog is one of my favorites, so, thank you.